In our today’s article we would like to share how to take care of different serviceware of restaurant. This article will give you good overview on different serviceware as well. 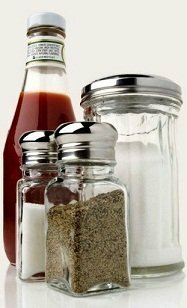 Cruets, bowls, bottles and other containers of condiments and table commodities should always be neatly arranged and in clean condition. Salt and pepper containers are to be refilled and wiped daily. And they also need to be emptied and washed weekly basis or whenever they become lumpy or damp. Always ensure the metal caps of glass salt cellars are free of any sign specially the sign of verdigris. The sugar bowls are to be refilled and wiped as per standard and emptied and thoroughly cleaned on a weekly basis. English mustard is to be emptied, washed and replenished for each meal course. Necks and mouths of chutney jars, bottled sauces and other containers are also needed to be wiped and cleaned between meal periods. All items of condiments should be cleaned and kept properly after each day’s service. No items should be cut on silverware dish since any attempt to cut can leave spot on the silver. The large silver are attended by the plate room staff and other special silverware should handled by the waiting staff. Burnishing machine- A burnishing machine is a revolving drum with a safety shield which is used for small articles of silver. Polivit-A polivit is an aluminum metal sheet consisting of holes which is used to clean enamel or galvanized iron bowl and larger pieces of silver. Plate Powder-Pink powder which works best with the adding of little methylated spirit to make the silverware shiny and maintain its bright condition. Silver Dip-silver dip is a pink colored liquid which must be used in plastic bowl. The soiled cutlery should immediately be cleaned after finishing of each course by the plate room staff, however but they are not recommended for immediate re-use. To get the perfect shiny look and spotless cleaning, the cutlery should be re-dipped in very hot water and are to be polished quickly but ensure that the water should be remain hot. As the cutlery becomes tarnished through contact with eggs, sharp sauces, curries or from non-usage. 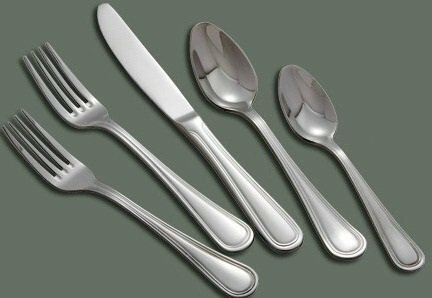 To make the cutlery free of grease, all tarnished cutlery must be soaked in boiling water with soda and wiped properly. Knives should never be mixed with the other cutlery. The knives can be cleaned in two ways, for example, the knives can be placed in the cleaning solution separately or the handles can be polished by the plate powder method. Glasses and glassware are to be washed in warm water and rinsed in clean hot water and wiped with a dry clean linen cloth. Glassware should be kept in metal sink so as to keep them in good and bright condition. Wood sink is a good option to keep the glassware safe from breakage. Water jugs can be washed in normal way. However special treatment may need to be taken in case of stubborn dirt but be careful to avoid any scratch. Manual (tank) dish-washing method-Under dish-washing method, to clean the soiled chinaware manually, they are needed to be placed into a tank of hot water with a soap detergent. After completing washing, the chinaware are to be placed into wire racks and dipped into a second sterilizing tank holding clean hot water with 75 degree temperature which will make the china automatically dried. This method is considered as more hygienic and widely used cleaning method. After drying, the chinaware should be kept orderly and neatly placed. Semi Automatic dish-washing method-Under this semi automatic dish-washing method, the chinaware have to free of any debris and then placed into wire racks. After that the racks will be passed through the machine which will lead the chinaware to be washed, rinsed and then sterilized in turn. After performing this action, the chinaware are to be kept for draining for two or three minutes and then stacked and placed on shelves for next use. This method does not require drying with tea cloths; automatic conveyor and the flight conveyor are required here. To make the chinaware dried thoroughly they should be wiped and polished properly with a moist cloth instead of washing it since washing often can leave the chinaware dull and streaky. A dry cloth should be applied on any chinaware to remove any mark. If any chinaware still has particles of food then it needs re-washing. All cups should be carefully inspected and thoroughly cleaned before serving. Remember that cracked or chipped chinaware never be used or served. Metal trays should be polished with metal polish. Use plate powder to clean silver salvers. Stainless alloy trays can easily be cleaned by only normal washing and polishing, however, the wooden trays need to be cleaned with a damp cloth and will be polished only with a dry cloth. The bakelite trays should be cleaned with metal polish. Always remember that aluminum alloy trays should be never be cleaned in the soda tank and they need to handled sensitively to avoid any spot. Here some more cleaning tasks are given for items that are also used while serving the guests. Ice should be always rinsed before serving it with drinks. The Pantry including shelves should be cleaned and the required items that are kept here should be neatly organized and put in order. The floor and shelves should be washed regularly. The steel hot plate should be cleaned with emery paper, the aluminum plates should be washed normally. The kitchen sinks, walls should be washed weekly.